Ten years ago in June 2006, I was awarded a CTV Fellowship to attend the prestigious Banff World Television Festival. Since then I’ve attended to report on most of the yearly Banff World Media Festival (Banff’s new name). Based on my personal experiences, I recommend the annual Banff gathering be something someone working in media/entertainment industry should attend at least once in her/his life (and may be even yearly). Great way to pitch projects to concentrated groups of decision makers from around the world, to meet and make friends with industry peers, and learn from the many Master Classes you given by some of the best creatives in the industry. Take this year as an example, knowing HBO Chairman and CEO Mr. Richard Plepler will attend the 2016 Banff, I did some research including watching these two videos to prepare. And I ended up learning lots from attending and meeting Richard in his Company of Distinction Keynote: HBO’s Richard Plepler Banff World Media Festival Banff. And yes, I felt totally honoured when Richard compared me to his mother after I asked him about his work experience at “RLP International“ quoting what I learned from his commencement speech to the Franklin & Marshall College Class of 2015! 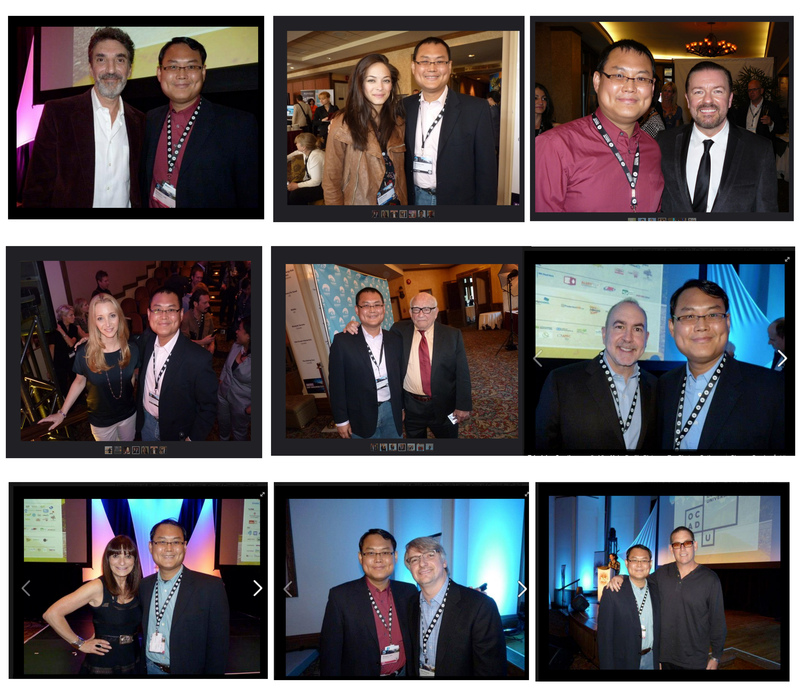 In the last 10 years, I’ve met and interviewed a lot of creatives and senior executives at Banff. The following are some samples of my video interviews. And asking Ricky a brief question on the 2010 Banff red carpet was something I still remember fondly today, six years later. *2008) Two years before I met Ricky, Banff attendees had the pleasure to meet the highly successful producer Jon Plowman (photo) who came to Banff to accept his Lifetime Achievement Award for his work as former head of BBC comedy and producing/executive producing great shows like Absolutely Fabulous, The Office, Little Britain, and The Vicar of Dibley! I wrote a brief report in 2008 but didn’t shoot any video. I did walk up to meet Jon and personally thanked him for his great work! *2006) Finally, It was my honour to meet and listen to Oscar winning director & writer Paul Haggis at my absolute first Banff in 2006. I wish my “professionalism” hadn’t stopped me from asking for a photo! Oh well, something I have regretted ever since. Anyway, the story of how Paul broke into Television is something I will likely remember for the rest of my life! Enjoy! *** More 2016 Banff World Media Festival stuff and one 2012 Master Class with Chuck Lorre (creator: Two and a Half Men, The Big Bang Theory). *2016) I think Girls is one of the most cutting edge and funny TV comedies in recent years. I had the pleasure this year to attend and listen to Jenni Konner talk in person. And I enjoyed the session very much. *2016 Banff) “The Night Of” Master Class: A Closer Look at HBO’s Limited Series Model featuring Academy Award-winning writer Steven Zaillian. After watching the video, I realized one of my favourite films “Searching for Bobby Fischer” was written and directed by Steven and he talks about it at timecode 16:10. P.S. On a personal note, I want to thank Scott Benzie, Lindsay Nahmiache, Robert Montgomery, and, for the last 10 years, many other team members for their kind help at Banff and arranging my press credentials, etc. I really enjoyed attending Banff and I’m happy to share what I learned with my readers/viewers. It has taken me some time to create this post and I am still amazed how many great creatives and industry senior executives I’ve met and tried to learn from all these years. And there are still some that I haven’t listed! Like in 2009 when I met and interviewed Ron Moore who amazingly re-imagined Battlestar Galactica (BSG)! Let me mention something most people might have missed. For a few years in a row, I noticed Tony Lacavera, Founder and Chairman of Globalive & former WIND Mobile Chairman, was sponsoring the Banff CRTC Breakfasts. (see my 2010 report) A side benefit was Tony got some “face time” to chat with CRTC Chairman Konrad von Finckenstein (photo of the two at CRTC Breakfast). Well, to me, that was money well spent in the long game of business! As you may know, this March 2016 WIND Mobile was sold to Shaw Communications Inc. for $1.6 billion. If you ask me, I say the C$1.6 billion deal has to be one of the biggest deals that Banff World Media Festival has *indirectly* facilitated! Pretty cool! This entry was posted on Thursday, August 25th, 2016 at 4:51 PM and is filed under Banff, Banff World Media Festival, Business, Canada, InterviewByKempton, InterviewByKempton-Arts, InterviewByKempton-Business, Video, YouTube. You can follow any responses to this entry through the RSS 2.0 feed. Both comments and pings are currently closed.